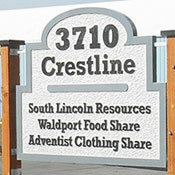 Call South Lincoln Resources (SLR) at 541-563-3710 and leave a message. We will call back! Volunteer Furniture Crew Members Needed! - See description. Looking for "people persons" for our Furniture/Appliance Program. Help move furniture, keep track of what comes in, goes out, client needs for specific items, greet people at the door, and process donations. Must be able to lift 50 lbs and not participate in the program. Work Tues/Thurs 1:00 - 3:30. Move stuff around with the guys and be a 'neighbor helping neighbor'. Call Tonner at 541-563-3710. Call 541-563-3710 and leave a message on how you would like to help. Call 541-563-3710 and leave a message for Donna Wengenroth, Manager. Call 541-563-3710 and leave a message for Dee Roberts, Director. Call 541-563-3710 and leave a message for Raenette Mohni, Chief Elf. South Lincoln Resources invites interested volunteers to attend our monthly board meeting as an introduction to the organization and our programs. Learn more. Additional volunteer opportunities are available through RSVP (Retired Seniors and Volunteer Program) in Lincoln County RSVP is also represented on the SLR board of directors. Contact Lincoln County RSVP at alucke@ocwcog.org, 541-574-2684, or visit rsvpoflbl.org.